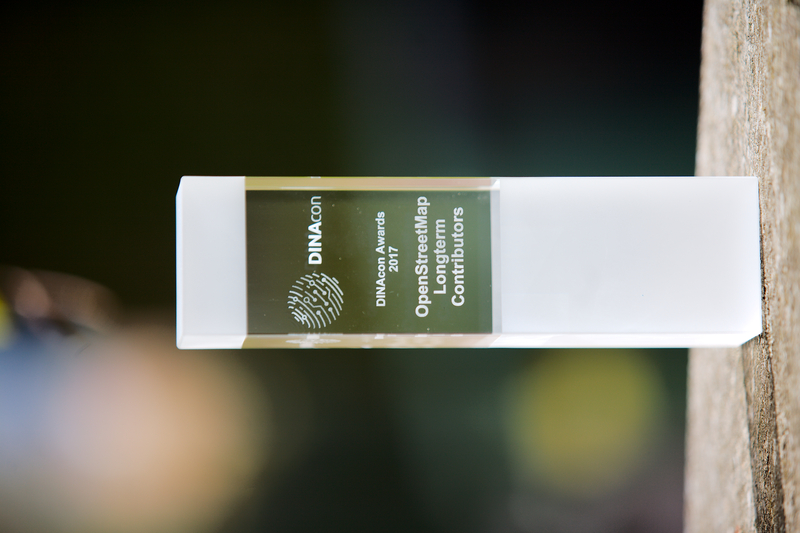 On Friday October 20th, a delegation of three members of the Swiss OpenStreetMap Association had the pleasure to receive the DINAcon Open Source Hero Award for OpenStreetMap long term contributors. DINAcon 2017 Open Source Hero Award for OpenStreetMap Longterm Contributors. In its laudation, the jury acknowledged that the work on OSM is a continuous process and a lot of manual work, and that a lot of persistence was needed to get the project to the state it is today. This award was accepted in the name of the whole Swiss OSM community and the OSM community world wide. SOSM will hold a workshop at DINAcon. We will show how to use OpenStreetMap to create a location map and how to tell stories with a map. This conference takes place for the first time, and we are excited to take part. Dieser Ausschnitt ist verfügbar zum Karten rendern am GEOSummit. Der hier gezeigte Stil ist OpenTopoMap. Wir haben den OSM Standard, Swiss Style und auch OpenTopoMap Kartenstile im Angebot. Wer nun eine schöne, A1 grosse, gedruckte OSM Karte haben möchte, soll doch am GEOSummit beim Stand A05 vorbeikomme n. Da der GEOSummit Eintritt kostet, haben wir auch gratis Tickets abzugeben. Wer also eine gedruckte Karte möchte, und dafür ein Ticket benötigt, melde sich bitte bei uns. Der GEOSummit findet in der Bernexpo (Karte) statt. Weiter werden am GEOSummit auch die druckfrischen A7 OSM-Flyer verteilt. Aktive Mapper können gerne ein paar holen kommen. It’s Sunday morning* and the third day of the State of the Map conference is about to begin here in Buenos Aires, AR—fashionably late, just like the past two days. Today, the breakfast, too, was considerably delayed. Though, I still find it notable, that not only lunch, but also snacks in the coffee breaks and breakfast are included with the conference attendance. The conference wifi only became available around noon yesterday, as the technical guy the organizers had hired to set it up hadn’t shown up. Also yesterday, the city deputy of Buenos Aires came by and held a short talk. She told about her dislike of maps back in school, how in her political duty she realized the importance of maps for a democratic society and learned to appreciate and like maps. She also told about her thirteen year old son who is mapping electoral districts after he was disappointed they’re not in the (paper) atlas he got. *Posting this in the afternoon, as Wifi was overloaded this morning. Five members of SOSM are currently in Karlsruhe, where this years State of the Map EU takes place. It is at the University of Applied Sciences, located in a very nice green area. On Friday, rendering was a topic, with alternatives to mapnik, alternative style sheet languages, rendering from vector tiles, and also 3D with OpenGL, WebGL and Blender. There were also a few presentations on quality assurance. In the evening there was a nice grill at the social event and we all had delicious food and good conversations. On the second day there were a few talks about data maintenance. The state of the license was topic to another talk, with Mapbox presenting the problems they encountered with the current license. There was also a group photo taken that day. I had a presentation at the FOSSGIS conference in Rapperswil about the data quality of OpenStreetMap in Switzerland (recording and presentation in German). Some of the analysis was already posted to this blog previously (post about street names). But there is also a lot of new stuff in this presentation. This map shows house numbers per person, so it shows where we already have lots of house numbers. For more details see the address layer of qa.poole.ch. As a reference value there is the address import of Denmark with a density of 0.4 addresses per person. The railway network was completed in 2010 in OSM. Interestingly, the length continued to grow. By now, most of the network is mapped with track accuracy. It is quite difficult to get reliable references for points of interest. One source I found is the “BFS Betriebszählung 2005”. It knows 23’077 restaurants and 4’683 hotels in Switzerland. OSM has about 10’000 restaurants and 2’500 hotels. All street names in 2015? Thank you to Sarah Hoffmann and Simon Poole for their contributions to this analysis. The topic of the third and last day of SOTM was the community. For example, Peter Miller presented his very numerous speciality maps, or Bob Barr had a heart-warming talk on weather open street mappers are rather pirates or pilots. There was also a presentation on OpenStreetMap addiction and how to diagnose and treat it. I personally enjoyed Kinya Inoue’s presentation very much. He talked about his mapping of historical places in Japan (and how that suddenly brought him in a quite dangerous situation). During lunch time, there was the annual general meeting of the OSMF, the worldwide OSM organisation. During this meeting, the OSMF board was elected, and we congratulate Simon Poole, the current president of SOSM, to his election as an OSMF board member, together with Henk Hoff and Frederik Ramm. And now it’s time for me to travel some more around Japan. Tokyo is huge (see picture, view from the metropolitan government building) but there are also other places to visit apart from the capital. The second day was focused on routing and navigation. A lot of companies are interested in this topic. Some of them requested to include auxiliary information into OSM which would not be about physical objects, e.g. identifying the extent of big junctions or whether a turn should be announced at a bifurcation. Over lunch a group picture has been taken. The evening was spent with causal talk and drinking: We had delicious Japanese food on a night cruise. We went on the boat in Kachidoki and did a tour around the harbour to the landmark building of a TV station. During the whole cruise many different dishes were served, so we got a broad culinary overview.